This article from the Washington Post describes how the Virginia Court of Appeals reversed and demanded a retrial for Perry Lee Compton. 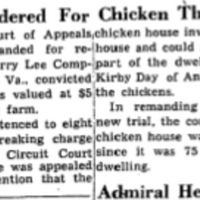 In this article from the Washington Post, Perry Lee Compton received two additional years on his sentence for bringing his 2 sons, both minors, along during his chicken raid. 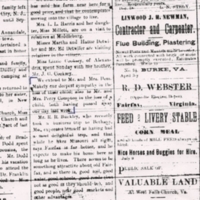 This article in the Washington Post describes the indictment of Perry Lee Compton on charges for housebreaking and grand larceny. 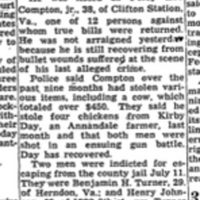 Over a nine month period Compton and several others stole various items including a cow and chickens. 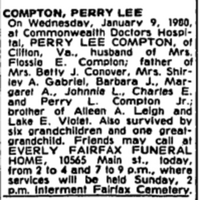 This is the obituary for Perry Lee Compton, son of Perry F. Compton, in the Washington Times on January 12, 1980. 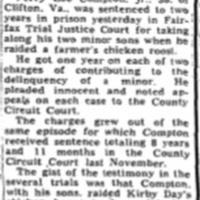 This is an image from the Fairfax Herald that states that Perry Lee Compton, son of Perry F. Compton, was arrested for the stealing of a bike. He was found guilty and was sent to the State Reform School until the age of 21. 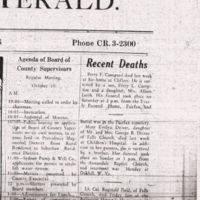 This is the obituary for Mr. Perry F. Compton, son of Felix and Eloise Compton, who died in 1956. He is the father to Perry Lee Compton and grand-father to Perry Lee Compton Jr. 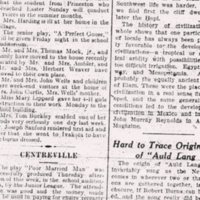 This is an image of a news article that states that Mr. Perry Compton has bought a home in Clifton from Ms. Amanda Detwiler. 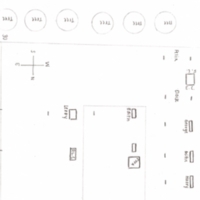 The house he bought was the house in which he grew up in. 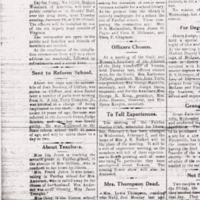 This is a picture of the obituary for Leroy Compton from the Fairfax Herald in 1909. 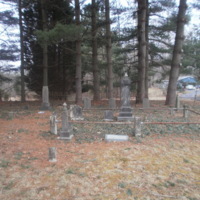 This is a picture of the Compton Family Cemetery.